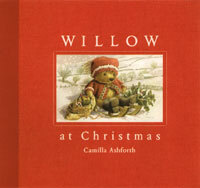 Willow, the little teddy bear who lives on Paradise farm, loves wintertime with its cold days and snow. He was delighted to wake up on Christmas Eve to discover that it had snowed in the night. He was going to have a white Christmas after all. Quickly Willow set about his chores, taking care of all the farm animals. His special friend, Little Pink Pig, came with him. Soon, Little Pink Pig and Willow were making their breakfast toast and planning their day. There was a lot to be done as they were going to be having a little gathering of friends in the evening. We follow Willow and Little Pink Pig as they make all their preparations for the festivities of Christmas Eve and Christmas Day. Camilla Ashforth's wonderful watercolor illustrations take us into Willow's little world and into his sitting room when his friends join him for a celebration of "Christmas and Friendship by the fire at Paradise Farm." This friendship is extended to all the animals on the farm as Willow takes them their presents once his guests have left and in the morning everyone on the farm celebrates together, wearing or carrying their gifts. This is a heartwarming little book which is sure to be enjoyed by everyone in the family and is a delight to read out loud.